On the west side of the Zangetsutei's tsuginoma ('next room') is the Shichijo tea room. It was designed by Sottakusai to preserve the original feeling of keiko (practice) and until the Shofuro room was built it was used as the practice room. On the south side there is an irikawa (tatami veranda), so that the room can be made wider. In Taisho 10 (1921) the Shofuro tea room was built to the west of the genkan (entrance hall) as a new practice room by Seisai. It is an eight mat room and has an irikawa (passageway between the room and the veranda) running around it from the east side to the west side. In the centre of the wall is a toko (alcove) with a width of one ken (about 180cm). The raised section of this on the right is the biwadai, which is where the biwa or lute was placed). Its design was based on a large tea room for the practice of the shichijishiki (seven chanoyu group training exercises) designed by Joshinsai. On the west side is the sadoguchi (host's entrance) which is one ken wide and has two fusuma (sliding paper-covered doors). Across the front of the base of the toko there is a large and particularly eye-catching tokogamachi (alcove rail) on which the marks of the adze are visible and which is lacquered in the tamenuri style, with transparent lacquer that allows the base colour to show through. 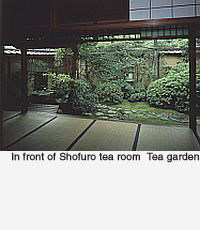 In Showa 34 (1959) an extension was built on the west side of Shofuro with a new entrance hall and tea room. The latter was an eight mat room with a toko (alcove) of one ken (about 180cm) in the middle, a jibukuro (utensil stand with a small cabinet) on the left and utensil shelves on the right. This was a reproduction of Joshinsai's eight mat room as it appeared in old drawings.